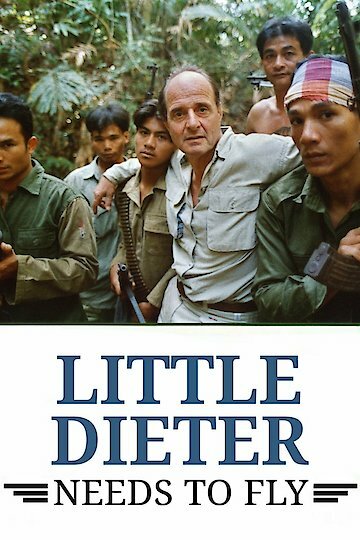 "In 1966, Dieter Dengler was shot down over Laos, captured, and, down to 85 pounds, escaped." This is a biographical documentary movie about Dieter Dengler, a retired Navy pilot. Born in Germany, Dengler survived the Allies bombing his town. As a young boy, he was apprenticed to an abusive smith. At the age of eighteen, he decided to leave Germany for the United States. He managed to get work with the Air Force, peeling potatoes. When he had the chance, he went to college in California. During the Vietnam War, this hard working young man joined the Navy. He went into pilot training. In 1966, he was shot down over Laos, held captive by the Viet Cong, and managed to escape. This documentary tells the story of his life. Little Dieter Needs to Fly is currently available to watch free on Tubi TV and stream, download, buy on demand at Amazon Prime, Fandor, Amazon, Vudu, iTunes online.